Partners- For the past several days some of the Key deer feeding on the salt marshes of National Key Deer Refuge have been observed alongside cattle egrets. Cattle egrets (Bubulcus ibis), are originally from Africa and their relatives there are used to traveling with rhinos, giraffes and other large mammals. 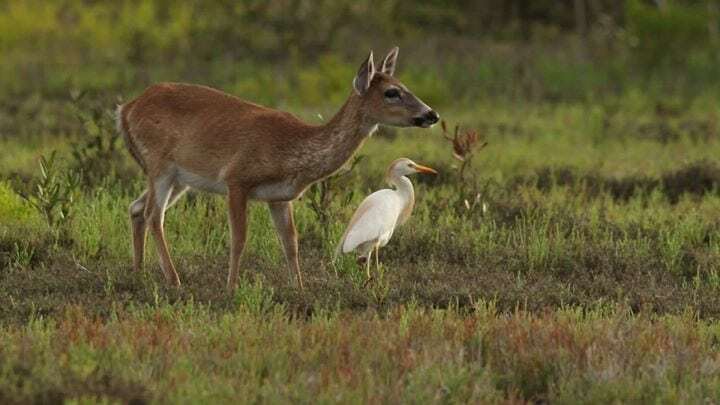 In this case, a Key deer makes a perfect partner, the cattle egrets are quick to snap up insects like flies that harass the deer as well as insects that are spooked as the deer forages. This is a common form of symbiosis called mutualism where both animals gain from the relationship.